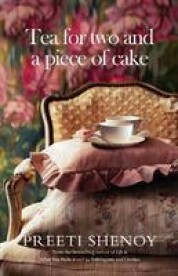 Tea for two and a piece of cake is Preeti Shenoy’s third book. Her first book "34 bubblegum and candies" is a compilation of some of her blog posts and her second book, "Life is what you make it" explores the lesser known topic of a mental disorder and how a young girl conquers it. You can read my review about it here. I have thoroughly enjoyed reading her first two books, but to be really honest I was a little skeptical about reading Tea for two and a piece of cake. It is a love story, albeit one with a twist.Now, I am not one for love stories, however unusual they might be.I think there is already a deluge of books in the market that talk about love and relationships. But once again Preeti has managed to surprise me. And How! Usually authors tend to follow the same pattern of thoughts and plot for all their books and this is where Preeti stands apart from the rest. Tea for two and a piece of cake is refreshingly different from not only her earlier works but also from the other books in the market. As she had done with "Life is what you make it", Preeti dares to go off the beaten track once again, this time to explore the different facets of relationships, be it love or friendship. Simply yet eloquently narrated,the story flows smoothly but at a very fast pace. Its a gripping tale and you really don't want to put the book down till you reach the end. But what really sets this book apart is the way Preeti has handled and described the intense emotional journey of the protagonists. As you read on, you realize the fragility and complexity of human relationships and that sometimes relationships just don’t fall into the norms and regulations prescribed by our society- and it really doesn't matter that they don’t! Tea for two is not your regular love story about Love lost and found. This is a very bold and unconventional book; a book that explores the fabric of human relationships and forces you to question your very beliefs and perceptions about them. Definitely worth a Read ! how are you Ruchira? long time! Thank you so much for a wonderful review and I am really happy you liked it. Coming from someone erudite and a voraciuos reader, this indeed means a lot. Her second book and loved the easy narration and how something so complex is brought out to the public very simple yet effectively. @Nishit - err ... this is not Preeti’s blog Nishit ! But I am glad you enjoyed her books! @Athira – yes, I love the effortless way she seems to deal with the topic ! You will enjoy this book too! read a lot of good reviews on this book .. all the best to preeti. just started....but still unsure how d title of dis book goes with a love story??? Preeti Shenoy has chosen an unusual theme. I have a feeling you are going to like it ! Have yet to read any of her books. But she sounds interesting! @Arti - Thank you ! this is for first time i read PS's book...i never knew its going to be such an entertaining exp..as the reviewer rightly says book has an ability to bind u till to the end. im straight away going to buy both of her earlier books which i missd to read till now.. like CB she has an ability to create addiction to her story telling art..thank god u hav made more of CB type genes in india...u guy's rocks and will make india read indian authors...waiting for ur next book.